Tesla crushed earnings in a way that was almost unfathomable. Adj EPS: $2.90 vs. -$0.07 -- yes, a $2.90 positive EPS versus an expected loss. Revenue: $6.82B vs. $6.05B estimate. "We stopped taking Model 3 reservations in North America in early July 2018 when we moved to a direct order system. Of the 455,000 net reservations that we reported in August 2017, less than 20% have cancelled." "Q3 2018 was a truly historic quarter for Tesla. Model 3 was the best-selling car in the US in terms of revenue and the 5th best-selling car in terms of volume." "In Q3, we delivered 56,065 Model 3s to customers. Based on trade-ins received from customers since the start of Model 3 production, more than half of those trade-in vehicles were priced below $35,000 when new. It is clear that customers are trading up their relatively cheaper vehicles to buy a Model 3 even though there is not yet a leasing option and the Q3 starting price of a Model 3 was $49,000." * Automotive revenue in Q3 increased by 82% sequentially over Q2, mainly due to a sharp increase in Model 3 deliveries. * Cash flow from operating activities in Q3 was $1.39 billion. This was mainly due to significantly improved volumes and profitability of Model 3. * Our cash position increased by $731 million in Q3 despite repaying $82.5 million of bonds. If you like being in the know, bookmark this page. WWW.cmlviz.com, it's like Yahoo Finance, but, ya know, better, smarter, faster. 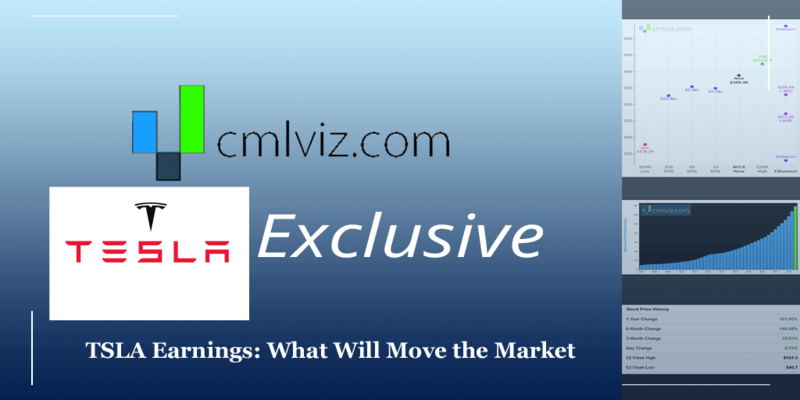 Tesla reports earnings Wednesday, 10-24-2018, after the market closes. The company pushed the date up a week and the market has taken that as anticipation of good results. Adding fuel to the burning bull-bear fire, Andrew Left of Citron Research, the famed Tesla bear and plaintiff in the lawsuit against Elon Musk for manipulating the stock price to harm shorts, has now turned bullish. But there's more to this report and this company. One phenomenon that has been little reported is that Wall Street's consensus analyst estimate for next quarter is in fact a positive earnings per share (EPS) number. The estimate is for $0.79 per share, in fact. Oh, but there's more discord. For the current quarter, which we will see below, the range of estimates from the nearly 20 analysts that cover it, go from a quarterly loss of $1.75 a share to a quarterly profit of $0.88. So, while the mean estimate comes in at -$0.07, this company remains an enigma to Wall Street - bulls to bears. But, if you want to know what will move the market as it happens, this it. * If TSLA	reports a revenue number above $	6.87 Billion	, that would be ahead of even the highest estimates. * If TSLA	reports an EPS number above $	0.88	, that would be ahead of even the highest estimates. Yes, while the average estimate is for -$0.07 in EPS, an analyst is as high as $0.88 and one is as low as -$1.75. In other words, no one has any idea what to expect, other than volatility. This is the little covered data point -- while we see a huge range in analyst estimates again for the following quarter, this time the average is quite high, at $0.79 EPS. * If TSLA	guides revenue above $7.78 Billion, that would be ahead of even the highest estimates. * If TSLA	guides EPS above $2.66, that would be ahead of even the highest estimates. Again, the range in EPS estimate makes it feel like a random number, with a low of -$0.57 and a high of $2.66. But here's where it gets interesting, yet more. You see that right -- if TSLA hits the mean estimates for EPS for next year, the company trades at a forward PE (for the next fiscal year) of 101.63. The number is very high, but for the first time ever, it's actually a number. No Tesla conversation is complete without a chart of revenue growth and cash from operations growth, in the backwards way. Yep, this chart comes from CMLviz.com as well. Free. Forever. Period.